I wonder if premenstrual symptoms (PMS) get worse with age because I’m increasingly bearing the brunt of it all. It used to be just aches and some irritability that last two days at most but now, it stretches to a week and sometimes more. During these days, I feel unduly anxious and completely disorganized. Once, it got so bad that I crashed the front of our car into a wall while parking! Evening primrose oil does not help me at all, even after I tried increasing the dosage. I’ve been relying on drinking milk to ease my PMS but it only helps partially, probably because I don’t drink it every day. I’ve never dabbled with essential oils until I met Grace of Geranium. She shared some useful tips with me about using such oils to cure common flu and they’ve proven to be useful for my child. 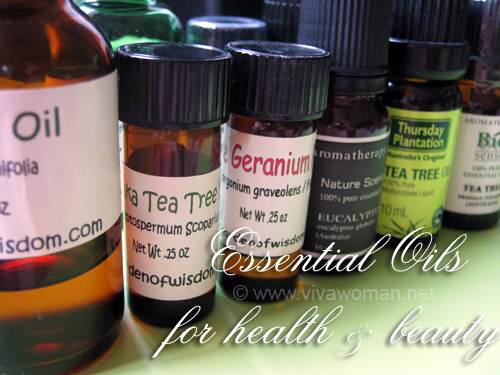 I also like the idea that tea tree oil makes an effective natural deodorant! In fact, I ordered the Rose Geranium (Pelargonium Graveolens) pure essential oil during the last spree because I wanted to use it to mask the smell of tea tree oil but I realized that it helps me with my PMS! From various sources I’ve come across, Rose Geranium essential oil apparently stimulates the adrenal cortex and helps to balance the nervous system, while lifting depression and relieving anxiety. The oil is said to have a regulatory effect on the hormonal system. 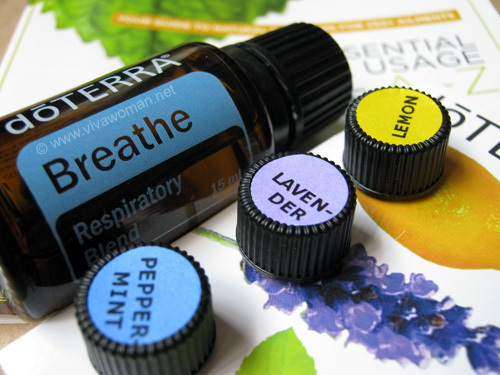 I use it via an aromatheraphy diffuser and the scent is sweet, but not overpowering. I would describe it as soothing and it does have a calming effect, helping me to feel less irritable. In addition, I also dab the oil on my pillow so that the scent can help me sleep better. The only problem I find is that the effects last only as long as the smell is present.Â But at least it helps and I’m actually currently enjoying the benefits as I’m typing this. Apart from Rose Geranium, other essential oils like Rose, Lavender, Clary Sage, and Bergamot also offer effective help to relieve PMS. I like the scent of Bergamot but I haven’t used it for PMS purpose though.Â However, if you’re pregnant or ill, you are usually adviced againstÂ using essential oils without expert guidance. I would be interested to try Naturopatch, which are body patches containing pure essential oils.Â I’ll probably order them viaÂ the next Lucky Vitamin spree as they look really interesting and I like the idea of having them on me.Â Has anyone tried them? Previous Post: « Facial cleansers: oil, cream, milk or foaming? Hmm I should definitely give this a try. I never thought to use rose geranium pure essential oil. Thank you for the advice! I’m really lazy when it comes to supplement. 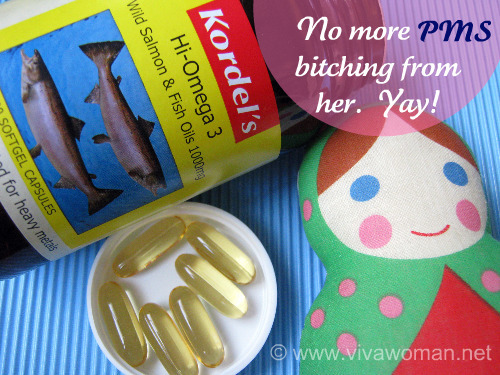 I took fish oil for awhile then stop…but cannot remember if it had any effects on my PMS. If you do try the essential oil, I hope it’ll work for you. But it’s a nice scent. OMG! I have been feeling out of sorts before my periods lately and it sounds similar to what you are experiencing. I get so angry, frustrated and depressed and it lasts for a week before I get my period. It really has affected the quaity of my life. I am interested to try Rose Geranium to see if it will help relieve my symptoms as well. Thank you for this article! It’s really frustrating isn’t it considering we have to go through this every month. I totally agree with you that it affects the quality of our life. My PMS is quite bad so I think it’ll probably help provide some relief to yours too. Rose Geranium is very soothing and it definitely helps to some extent, I use it in bath and diffuser. Evening Primrose Oil and Fish Oil also help me to some extent but I am still searching for something that could take care of PMS completely. Ya, I wish to find something that can resolve the PMS pains too…haven’t got luck. Some people told me wild yam cream but I’ve yet to try…abit hesistant. Geranium is a beautiful scent. You can add lavender to it and it’s extra soothing. Bergamot is great for headaches too. Yes, it’s really lovely. I like products with Geranium…but haven’t tried with lavender. Will give it a try next time when I get the lavender essential oil. I tried using geranium with emu oil for a massage too…not bad but I haven’t persisted. Try it for the aromatheraphy benefits; it’s temporary but at least it provides some relief. I also realise that my PMS is getting worse as I grow older. It is not my moods but I get mouth ulcers, drier skin and the occasional headache. I try to consume more Vitmain C to build up my immunity and it does seem to help. You even get ulcers? I’ve never heard that one…but yes, I get occasional headaches too. Good idea with the vit C. Some multi-vits should help too. Oh I have seen Kordels at Watsons or Guardian! I will check it out next time. You have a good point about the brand. That’s something I didn’t really think about. I don’t recall having any PMS moods for a long time (unless we count eating junk food like chips and choc abt a week or so before period). I kinda have put that down to my taking my EPO religiously since my 20s. For the essential oils, I’ve been using Rose Geranium (bec it smells so good) and Lavender (bec it’s easy to get)for many years at least twice a week. But that’s bec the tealights are pretty and the aroma round the room is fabulous. I never realised it could have helped in regulating PMS moods as well – thanks for the article ! Wow, you’re a lucky gal. Actually my PMS wasn’t so bad when I was younger too. Just some backaches…but in recent years, it’s deterioriated. Not sure if child birth has anything to do with it. Hey, I’m looking for Rose Geranium tealights or candles. Where did you get them? Thanks for the tip! For menstrual pain I’ve found that I have a lot less pain if I exercise for a few days before (doesn’t have to be intense, just walking for 15 minutes a day will do it). The mood swings – ahh – that’s another story. I’ve tried fish oil, drinking milk, cutting out milk, drinking soy milk, cutting out soy milk … sometimes it’s better and sometimes it’s worse but I haven’t been able to pinpoint why. I’ll definitely be trying out the essential oil. The milk used to work well for me until recently. Maybe cos I cut down cos milk is diary and that contributes to my acne as well. The essential oil unfortunately, isn’t a permanent solution. Someone suggested rubbing the oil directly on my sole for better results but not sure if it’ll be suitable for everyone so I didn’t want to recommend since most essential oils can cause irritation when applied on the skin directly. hi! is there someone you know who often conducts the spree from Lucky Vitamin? i’m also interested in the naturopatch! I just ordered mine from spreehows at livejournal. Have ordered stuff through her sprees and was happy with the progress.